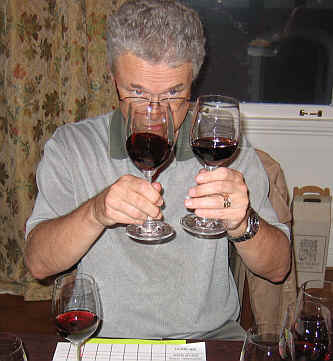 It was inevitable--after several decades of tasting Cabernets, Bordeaux, Italian and Spanish reds, one of these days we had to have a look at the wines of Greece. 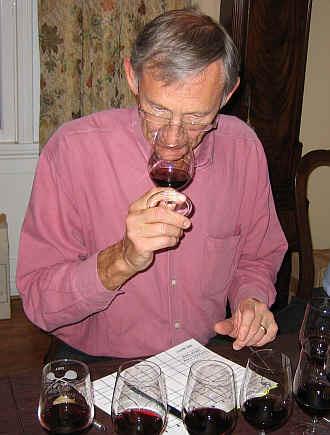 Host David Greiner was curious to survey red wines from an ancient civilization were, in fact, civilized. 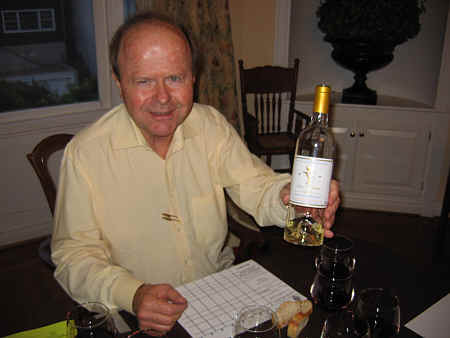 Host David Greiner brought the Wine of the Night...a dry white from Chateau d'Yquem called "Y" or "Ygrec." Very aromatic and displaying lots of Sauvignon...2000 vintage. 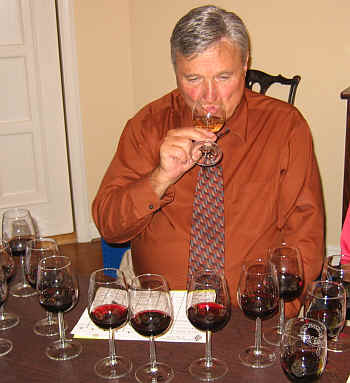 We assembled a range of wines. We did not want hugely expensive bottles, but we did not want "everyday" plonk, either. The set ranged in price from $23 to $33 per bottle and we asked the importers to guide us towards the best wines in a 'reasonable' price range. 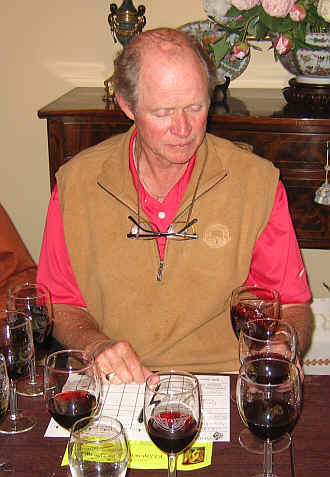 One wine emerged as the group's favorite by a modest margin. 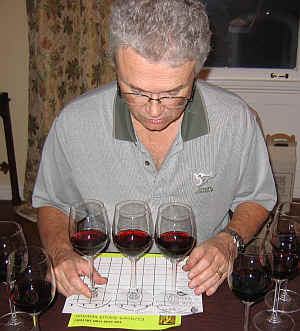 Second place through sixth were separated by a mere five points, with two wines well behind the pack. I felt the overall quality was in the "good" range, but the wines struck me as on a similar quality level as nice Cotes-du-Rhone wines. I will admit to not being particularly familiar with the wines of Greece, so I am not an expert in evaluating their wines. As an unbiased consumer, though, I can say I would not be buying a second bottle of most of these. Clear in appearance, this wine displayed a ripe, lightly jammy quality on the nose, followed by an earthy tone and, finally, a touch of wood. It's a dry red wine with medium to medium-light body. I found it somewhat austere and bound up...a perfectly standard wine for me, though it's bottled and labeled to compete with fancy "New World" wines. I gave it no stars on my three star scale, being a wine of decent, standard quality. The label of this wine does not indicate in any clear fashion its vintage date. It's clear in appearance and medium to medium-light ruby in color. There's a mildly berryish aroma which struck me as reminiscent of a good, simple, Grenache-based Southern Rhone Valley red. It's medium-bodied and perfectly standard red with with mild tannins. No stars. My top wine finished in sixth place. I found the appearance to be clear and the wine showed a medium+ garnet color. It's beautifully fruity, showing hints of raspberry and a strawberry note without being jammy or over-ripe. It's dry and moderately acidic on the palate. Medium-full bodied...not heavy. I liked the interplay of the red fruit flavors with a spice tone, reminding me a bit of some brown spices...cloves, perhaps? The wine is nicely balanced and well-suited to service with well-seasoned foods. I gave it a one-and-a-half star rating on my three star scale. Medium ruby in color and clear in appearance, this wine offered a nicely berryish fruit character with a faintly jammy quality and some oak and spice notes. Dry, it's a medium-bodied reed wine with bright fruit on the palate and a bit of oak, as well. There's a touch of tannin here, more noticeable in a tasting than if consumed alongside some well-seasoned meats. I gave this a one star rating on my three star scale. Clear in appearance, this shows a medium ruby color in the glass. It's a nicely berryish red and I found the aromas to be reasonably attractive. It's dry and moderately acidic, with medium body. I faulted it for being astringent and coarse, though I suspect with food this is a nice bottle of wine. It's clearly "old world" in style, to its credit. Probably worthy of some notation, though during the tasting, I did not cite it as star-worthy. I was unsure about including this in the line-up, given that it's not viewed these days as a classic Greek grape...at first, the aromas of this dark ruby, clear-in-appearance red offered some mildly spicy, almost 'brushy' and "garrigue" notes. But as it sat in the glass, I found an "off" note in the wine...not out-and-out "corked," but veering in the direction of a flawed bottle. Dry and medium-bodied, I simply found the earthy-to-dirty element of this sample to be very bothersome, but I was the lone wolf with that perspective. Medium ruby color and clear in appearance, this wine offers an earthy and mildly 'dusty' note on the nose...less fruity than most of the wines in this line-up. It's dry and mildly acidic, with medium+ body. I found it to be a simple, lightly berryish red wine...a half-a-star rating from me.